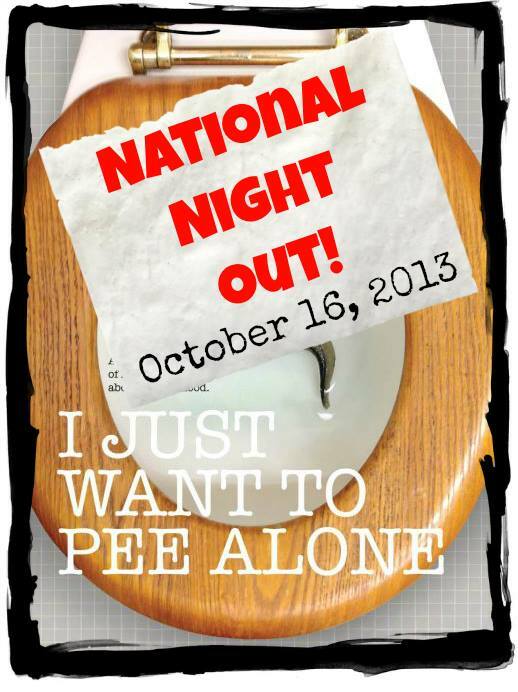 Wednesday, October 16th has been declared I Just Want to Pee Alone Day! I’ll be joining fellow I Just Want to Pee Alone co-authors all across the country in hosting a night out – and you’re invited! Come alone! Bring a friend! A sister! Anyone who you know needs to pee alone while making new friends. Wondering what’s up with the New Jersey event? It’s low-key at a great bar that’s across the street from the train station and has parking close by. I’ll be there with “Hello My Name Is…” stickers so we can all get to know one another. Go ahead and “Like” End of Elm on Facebook so you can get directions and see how cool it in inside. Once you get there that night, just look for the Pee Alone ladies – I’ll be the tall blonde holding onto a beer and trying to hide whatever crusty goo my kids rubbed on my clothes before I headed out the door. You can find all of the events listed above and more here: in the Events section on the I Just Want to Pee Alone Facebook page. We’re adding more all the time, so keep checking in and be sure to RSVP so we know who is coming. If there isn’t one planned for a city near you, don’t fret, because YOU can host. It isn’t hard. Just pick a location near you and a time on October 16th that works for you. It doesn’t need to be fancy. Something casual tends to work best anyway. Once you’ve got the details figured out, send Jen an email at sweetsadiecreations@gmail.com and she will add your event to the page.